This is a guest post from Anna Roberts, a People & Talent Associate at Classy. Anna works on all things People-related, from recruiting to training to company culture. When she’s not enhancing the work culture of Classy, she is putting her piano and voice training to work performing at weddings and other events. When I came to Classy in 2014, I had never worked for a technology company or a start-up, so I knew I’d be in for an adventure. What I didn’t expect was to be surprised and challenged long after my “new hire” status expired. Classy has helped me learn and explore more than I ever expected. I’d never experienced a company culture so focused on growth and community before. Here are nine examples of how Classy continues to surprise me, day after day. People here don’t just like what they do, they LOVE what they do. One of the first things I noticed when I started at Classy was just how engaged and passionate the staff is about both the product and our mission to empower the world for good. Classy employees lead by example. They love to volunteer with, donate to, and fundraise for their favorites causes. And you can’t hold the engineering team back. They are determined to create the most robust, intuitive, and innovative product in the world. The best part: it all starts with the CEO—you can’t tear yourself away from listening to him speak about his vision for the company. His enthusiasm filters down to every staff member, and the energy is so infectious. It’s one of our top recruiting and retention tools. I have a curious personality and a tendency to ask questions…a lot of questions. At Classy, I’m pushed to find the answers. So when I wanted to know if I was on track to hit a particular hiring goal, I of course asked my manager for the stats. She used it as a learning opportunity and encouraged me to calculate my progress on my own. While it wasn’t the immediate answer I wanted, it made me realize I had access to the information myself if I took the time to figure it out. I felt silly at first but then empowered. People here are incredibly supportive but you won’t get your hand held. This accountability pushes employees to be the best they can be. In a meeting with one of our sales managers, the recruiting team wanted to get a feel for what he looks for in an ideal candidate and how he manages his team. Our questions were pretty standard, but his answers blew me away. He described his management style as nurturing, in that he focuses on the development of each individual both in and out of work. His point of view is that an individual must be happy in their personal life in order to be happy and motivated at work, so he takes time to get to know each team member on a personal level. He makes sure the conversations aren’t just about contracts, goals, and metrics. 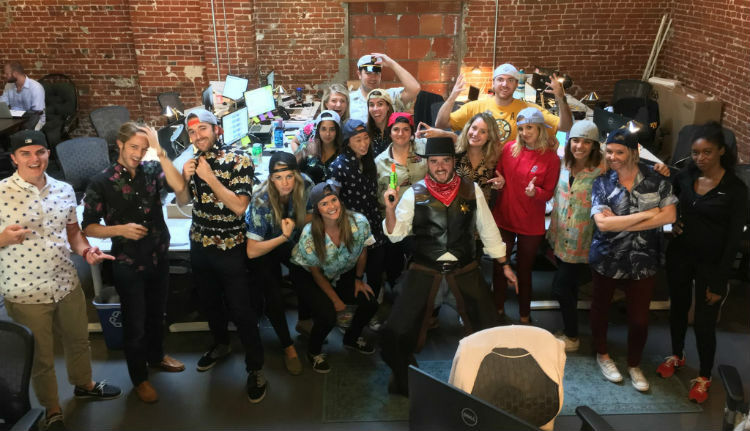 For Classy’s 2015 Halloween party, the entire Outbound Sales Development team (about 15 people) dressed up as their manager, Andrew. While the group didn’t win the costume contest—it was thick competition—they did make a statement that they love their manager. After all, imitation is the most sincere form of flattery. They also made it clear that Andrew has a distinct style. Allowing employees to have fun at work encourages creativity and camaraderie, both of which are vital components of Classy’s company culture. I’m frequently asked for my opinion and advice. Despite being quite junior in terms of experience when I came to Classy, I’ve never been made to feel like I don’t know what I’m doing. In fact, my opinion is valued and respected, even among those in higher level positions. Classy is a place where people respect each other as experts in their functional areas. These are just some of the questions that have been posed to me many times. I’ve never before had a job where I’ve been asked what I’d like to do as opposed to just being told what to do. The result is that I’m encouraged and excited to go the extra mile to grow my skills. You’ll frequently find me working outside regular business hours or reading for work instead of pleasure, but it’s not because I’m forced to. Productivity goes up when you give employees the space and freedom to choose, grow, and learn. Always Be Learning is, in fact, my favorite of Classy’s core values. Ever heard of a little thing called OKRs? Neither had I. It stands for Objectives and Key Results, and is a system invented by Intel that we use at Classy to track goals, metrics, and performance. OKRs allow for goal alignment and transparency across the organization. I love to plan ahead and I like a good amount of structure in my life, so having deadlines and concrete things to work toward keeps me motivated and engaged. Through the OKR process I can easily see how my contribution affects my team’s goals and, ultimately, the company’s goals. At past jobs I was given tasks and responsibilities, of course, but it always felt like I doing the same things, day after day, without any real feeling of accomplishment. Here, it’s black and white: you can see how you impact the overall success of the organization. And as a company, we always celebrate our successes together. We’ve beefed up our assessment process in a huge way by including 360 degree feedback. This means that it’s not just lower levels getting assessed. Everyone reviews their manager, and those at manager level and above get feedback from three peers with whom they work closely. The best part is that each employee assesses how they embody our core values. The values aren’t something we just put up on the walls of the office to look at. It’s expected that each team member adhere to those values, so a percentage of your overall assessment score is based on how fully you personify them. Each employee is also asked to assess the effort and progress made toward their goals and objectives for the past year, and to identify areas of personal and professional growth for the coming year. As painful as assessments have the potential to be, every effort has been made for the process to be a thorough, thoughtful experience with a focus on growing our employees’ potential. One of our C-level executives wore a full-body Spiderman suit to work a few weeks ago. I can’t reveal his true identity, but here’s a visual. The point? At Classy, we keep office life fun and don’t take ourselves too seriously, no matter what our position is in the organization. No organization is perfect, including Classy. There will always be areas for us to work on and improve. For me, the pros outweigh the cons and I’m grateful everyday for these surprises. These are the things that drive employee productivity and engagement, and it’s the little things that create such a rewarding workplace.